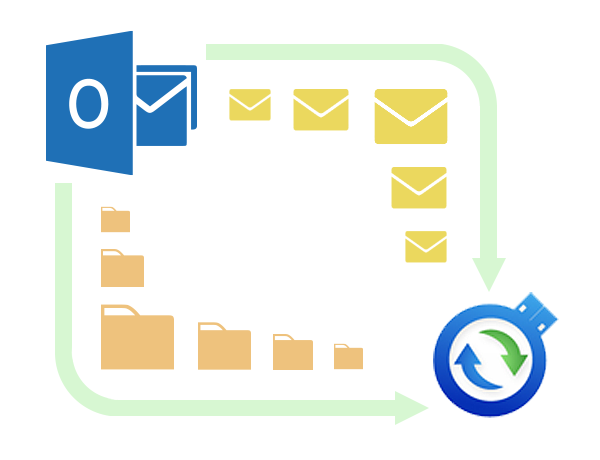 Plug2Sync and Backup: PST backup tool to automatically backup Outlook emails and data. Customize PST Backup options and only backup Outlook emails or specific Outlook folders. 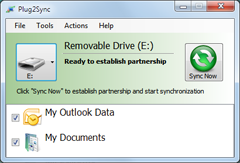 Plug2Sync and Backup offers you a simple and carefree Microsoft Outlook backup method. You can backup your Outlook .PST files easily by plugging in a memory device, such as a USB flash drive, SD card, external hard drive or other devices, and with the press of a button your Outlook data files will be replicated and backed up on the removable storage device. All you have to do is plug in the memory device and set up Outlook synchronization. Plug2Sync and Backup also offers you complete flexibility to create Outlook backups which are customized according to your preferences. You can choose to backup PST files entirely or you can choose to backup Outlook emails only or just specific Outlook folders. Our software can be used as a reliable PST backup tool that uses a process of data replication to backup PST files on external drives, USB flash drives, SD cards, or other removable storage devices. Backup Outlook emails and data automatically to any removable storage device. Automatic Outlook backup can be extremely simple to do and will prove very useful because it will always keep the most updated PST backup files. In order to backup Outlook automatically in the background first you need to set up Outlook synchronization and then backup Outlook PST files on the memory device, such as a USB flash drive, external hard drive, SD card or other removable storage device. After the first sync and backup process, you will have the selected Outlook folders backed up on your memory device. When you plug in the device next time, synchronization will be done automatically in the background with your selected options. So, the only thing you need to do is plug in the memory device each time you want to run automatic Outlook backup, and real-time synchronization and backup will run in the background keeping your latest Outlook data backed up. Restore Outlook folders using Plug2Sync and Backup. You can restore Outlook data simply by using the memory device with the backed up copy of the data. Once you’ve synchronized and backed up Outlook to a USB drive or other memory device, you can then restore it easily by re-connecting the device and importing the data via the standard Microsoft Outlook Import Wizard. The backed up PST files can also be opened directly from the external memory device, and they will always have the most up to date version of your chosen Outlook folders, as long as you’ve made sure that the memory device was connected to your computer, laptop or netbook while or after using Microsoft Outlook.